The Strasburg Station is all decked out in holiday cheer anticipating Santa’s 50th visit to Strasburg Rail Road. 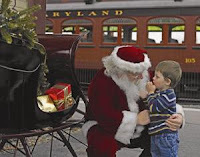 Santa’s Paradise Express will pull in to the station this weekend, December 19 - 21st. The holiday celebration begins on the platform of the East Strasburg Station as the sounds of the season fill the air and the platform sparkles with lights. Passengers relax as an authentic vintage steam train, warmed by a potbelly stove, travels on a 45-minute journey, past more than 1,000 acres of picturesque farmland on the way to Paradise, PA. As the train chugs down the track, Santa, carolers and musicians stroll from car-to-car spreading the magic of the season to thousands of families who believe. Tickets: Coach tickets are $16 for adults and $10 for children age 3-11. Tickets can be purchased at http://www.strasburgrailroad.com/ or by calling 717-687-7522.